The Apostle Paul wrote his first letter to the Corinthians as a guide for handling disagreements in communities.In a time when society is so quick to judge others, Paul taught the Corinthians to stand above and live in love, even when it seemed impossible. 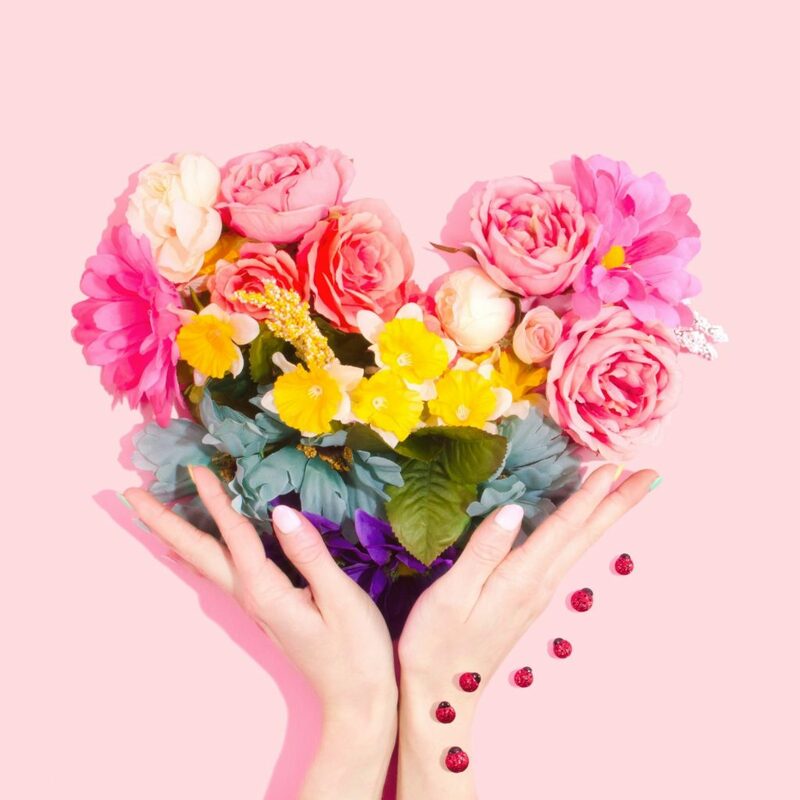 Perhaps today we need to show love to those around us, even when we don’t have the same perspective. 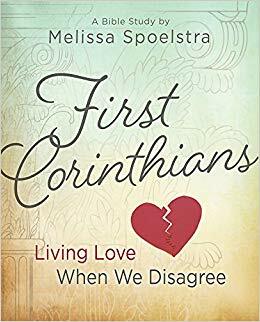 Everything is not all about ourselves, and Melissa Spoelstra’s study First Corinthians: Living Love When We Disagree gives practical advice on how to treat those around us in a loving, God-honoring way. While we’re not always in disagreement with our fellow Christians, we may be divided in our families, neighborhoods, workplaces and communities. When we apply the Scriptures to our culture today, we’re presented with places for living love. When you participate in this study you’ll learn the Biblical methods for unity even when we disagree. We’ll have open-ended discussions about modern topics and opportunities to cultivate unity- even when we disagree. “Living Love When We Disagree” is so timely in today’s cultural climate! Our leaders perceived this study to be very relevant to our lives. We’ll explore how to stay in unity when we disagree on denomination topics such as speaking in tongues or the role of women in the church. Or topics such as political elections. Even topics such as shadow banning and hiding Christian content from social media and search engine sites. Often we avoid the discussion because we don’t know how to find the common ground of unity. METHOD 1: Read First Corinthians with any Bible translation, study the passages using the inductive method, SOAP method, verse mapping, or a study Bible with commentary. 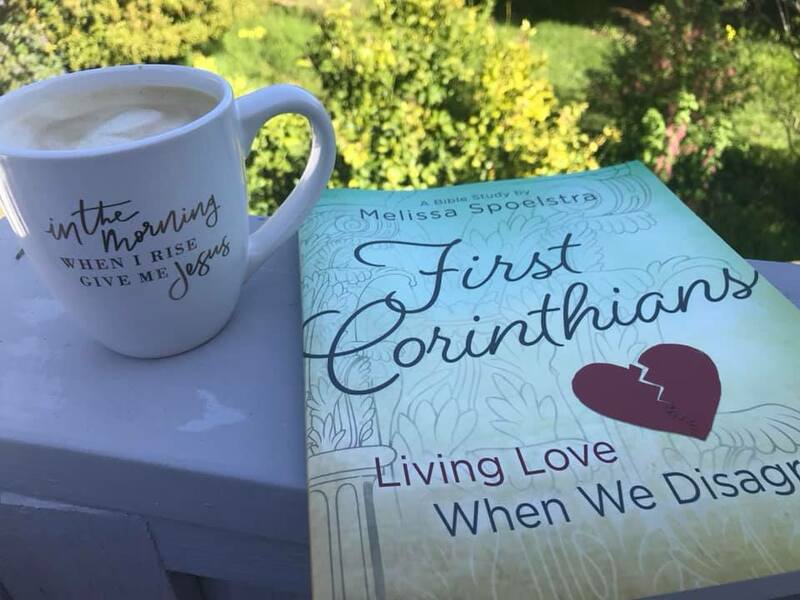 METHOD 2: Use the study guide “First Corinthians: Living Love When We Disagree” by Melissa Spoelstra as we dive deep into Paul’s letter to the Corinthians. It helps you develop a better understanding of the letter, verse-by-verse with its historical and contemporary impact. (Study guide is available in Kindle or printed format). METHOD 3: Use the study guide along with DVD teaching videos from Melissa Spoelstra. These videos are OPTIONAL and not required for Bible Cafe™ participation. Because they are copyright protected, they will not be shown online or in Facebook groups. As with other Bible study workbooks- such as Beth Moore, Priscilla Shirer, and Lifeway Women studies- you don’t need a Bible degree to understand the teaching material. Your personal study it is completed in five days each week with readings, questions, and discussions to guide you through each lesson. You’ll find the lessons to be challenging and inspiring. Melissa Spoelstra uses real life examples, along with the Bible and historical background. If you’re a busy Mom like me, you might do your daily lessons in the early mornings and have coffee with Jesus. Or wait until later in the day when the house is quiet. If you’re working outside the home, you may find it helpful to wait until the weekend and complete two or three lessons each day. Whatever method you choose, get into the habit of daily quiet time with Jesus. You’ll be BLESSED! Like most studies, you get out what you put in. So don’t expect it to be very impactful if you rush through all five lessons the night before we meet. There is a bit of responsibility on your part to pray, work through the study guide, and connect your heart with the Scriptures. If you’re not committed, those activities can make you feel overwhelmed. Pace yourself with daily Bible study (instead of rushing to finish it) and you’ll transform your understanding of the Scriptures. It will become a daily habit you won’t want to miss! After choosing your study method, then you’ll decide if how you’d like to CONNECT in our community. You’ll have the opportunity to join the Facebook discussion groups (free), the Zoom virtual discussions by phone or video (partner members), or an independent study through our website forum (partner members). Discussion groups usually last one hour and are based on the study guide lessons. Facebook groups are held seven days a week, mornings and evenings. Look for the schedule posted in the Facebook group. Zoom meetings (virtual Bible study groups) are held on Mondays at 3PM Eastern, 7 PM Eastern, and 9 PM Eastern for partner members. As we read and study together, we cultivate friendships and transform our faith. Our study begins the week of April 22, 2019. We start reading week one, day one on April 22. Our first week of discussion groups and Zoom conferences is an Introduction Week to meet your leaders, see how this works, and reconnect after the Spring break. No reading assignment due that first week! Join this Bible Cafe Study! Would please like to join this study please. My book came the other day. Miss being here. Thanks. Blessings. I would like to join this study too. I want to join the zoom meeting on Mondays @ 3:00 ET but can’t find the link. Looking forward to doing this study. It’s been awhile since I’ve done a study with WBC. Have the workbook, I’m ready!! Welcome back Mitzi, great to see you again! I have my book and ready to begin. Looking forward to this study. I have my book and the date is marked! I want to join in on this study. I have my book and am looking forward to the study. I just received the book. I’m ready to start this Bible study. I have not done a Melissa Spoelstra study. Looking forward to this new study. I have done Melissa Spoelstra studies before and enjoyed them very much. I have my book & am ready to start my first WBC study in a couple years. Looking forward to it!